For me, one of the most enjoyable aspects of Christmas gift giving is buying games and toys for my three grandsons. I have already started. The parcel containing my Paw Patrol items for my three-year-old grandson arrived yesterday. During my internet research, the toys and clothes above caught my eye. From the top left corner 6 in 1 game set. I bought this set for my two older grandsons last year and we have many enjoyable hours playing with the various games. My five-year-old likes the snakes and ladders and the eight-year-old is progressing well with chess and easily beating me // Mini Boden cosy bear coat Nordstrom // Girls teddy bear pyjamas John Lewis & partners // Paddington Bear with boots John Lewis & partners // Shop jigsaw // Teddy Bear jigsaw puzzle John Lewis & partners // Baby magic touch piano Nordstrom // Baby road trip ride in car Nordstrom // Polar Bear pyjamas John Lewis & partners. 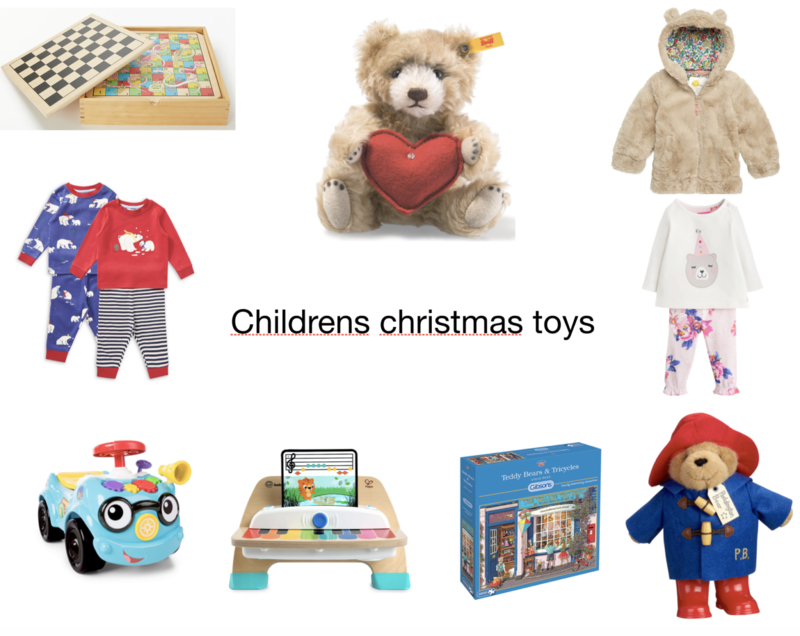 Marks and Spencer have great gifts for very little ones. How about fancy dress, my five-year-old grandson loves to dress up. Does the child have a favourite character such as Thomas the Tank Engine or Peppa Pig? Check out themed presents here. Nordstrom has a great children’s gift selection.